Dolemite is a pimp who was set up by Willie Greene and the cops, who have planted drugs, stolen furs, and guns in his trunk and got him sentenced to 20 years in jail. Can you dig it? Six reasons why Dolemite is the most awesome bad movie ever. In a somewhat surprising move, this blaxploitation classic has been released on Blu-Ray! It's a gorgeous, crisp transfer, full of film grain, that is far nicer than the earlier, insecure, rat-soup-eating 4:3 DVD release. If you see a ghost, cut the muthaphukka!!! In the pre-roll for the MST3K Club's Thursday showings, JHarris has collected he trailers for some classic bad movies that have never been "MST3K'd", including Dolemite. 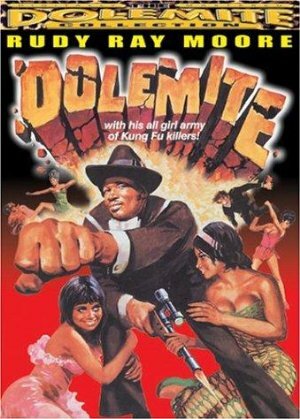 YouTube has the entire 1976 sequel to Dolemite, The Human Tornado (you will fall down laughing after the first 30 seconds of the opening credits). There are also several clips from Dolemite, including one titled "How not to edit a film". The Human Tornado is one of my fondest discoveries in college, shown to me by a friend specifically because he knew — rightly, might I add — that it would help me deal with a rough breakup I'd just been through. Here's hoping it gets the treatment it — well, "deserves" is an awfully strong word, but a nice treatment nevertheless. It was a movie so bad that it wasn't clear if it was deliberate or not. I mean, it was made by a comedian, right? Any film that includes a character called Hamburger Pimp knows what it's doing. I have the Rudy Ray Moore DVD collection, and The Disco Godfather is probably the film that's most representative of Moore's work, in all of its strengths and weaknesses. But hands down, the most balls-out bonkers entertaining film in the set is Petey Wheatstraw (the Devil's Son-in-Law). Dolomite -- it's real bad out there. There's nothin' in my trunk man . . .